One Hot Lap: Thankful for Having You! When I started One Hot Lap just over 3 months ago, I was looking for a home for my performance driving needs; a place where you can talk about trailing throttle oversteer without having to explain that this is a performance driving technique and not the opening act for The Clash or some other punk rock band; a place where you grin over picking up 6 cones on your fastest run at the autocross (cone marks and ripped underbody trays be damned); a place where you can freely talk about the thrill of diving into a corner to make a pass at 50+ mph in a go-kart without air bags, seat belts or even a roll bar. 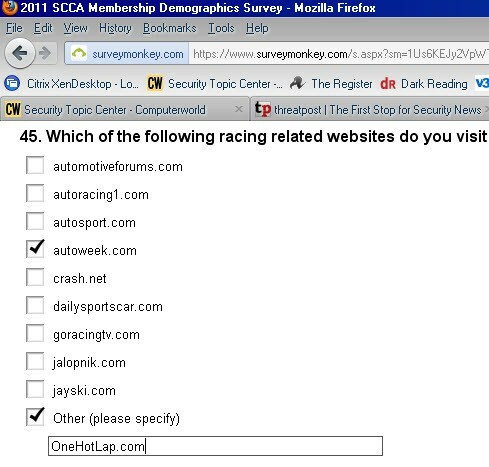 You get the idea: I might have called the site Performance Driving Anonymous if the name wasn’t that long. And if you are seeking therapy here on the site, we probably have a lot in common. Please help me make One Hot Lap what you want your performance driving home to be. Send me ideas for write-ups. Car setup, track reviews and videos, driving technique, group buys, silly skits and banter, podcasts, discounts, what else would you like to see on the site? Whenever you get a minute, please remember to comment on the posts or at least click off the Reactions under the post. Help us turn One Hot Lap into a nice home for car enthusiasts who share a passion for performance driving and have a sense of humor. Safety in numbers – if we are all crazy, then maybe it’s not so bad…as long as we’re crazy together! Christo your comment on having trouble giving people advice on practical cars is very funny. I have the same problem and everyone comes to me when they want a car. "My sons turning 16 soon and needs a car" I give two options, if he wants to be cool... get a cheap older BMW (always a good option due to the cool factor and personally I think that they are super easy to work on) or if you don't want to worry about it get a Honda.